Not a reprint or a lost manuscript but a freshly written, top-notch memoir by a former British artilleryman now in his 90s. Like most middle-class British youths, Ellis was less concerned with Nazism than the excitement of an approaching war. “A continual backdrop of international tension accompanied the years of my transition from boyhood to manhood,” writes the author. In 1938, after considering various services, he joined the Hussars, formerly elite cavalry but now artillery. Readers will share Ellis’ dismay at the abysmal state of his nation’s rearmament as he and his mates encountered squalid facilities, foul food (even before rationing) and guns that were usually too old to function. By early 1940, his unit moved to Egypt for a painful introduction to desert campaigning with another group of soldiers who remained disorganized and poorly equipped. Fortunately, the author’s baptism of fire occurred against the Italian forces, who were even worse off. A year later, the newly arrived German Africa Corps routed the British, and Ellis’ unit found itself trapped in Tobruk during the legendary nine-month siege. Afterward, his unit advanced only to be wiped out in the April 1942 German offensive. During the fighting, most of his friends died. Ellis was captured and endured horrendous deprivations as a prisoner before escaping to live with surprisingly hospitable Italian peasants in Northern Italy until Allied forces drew near. Neither cynical nor nostalgic, the memoir is an engrossing account of life in the old British army, the actions of artillerymen in battle (exhausting and no less dangerous than infantry fighting), and the author’s experiences after capture, which required more moral fiber than battle. 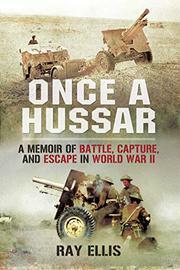 Readers will yearn for the sequel, Always a Hussar, not yet published in the United States.